As a full-service commercial moving company, we know that people hate moving. Even when you’re relocating to keep your dream job, the process of packing everything up and getting used to a new location is stressful. In fact there’s a number of things you’ll need to do before and after moving, like getting a new driver’s license, switching over the utilities, finding a new home, selling or subletting your current place, and everything moving-related. So it really boils down to how much you love your job or want a new one. While many individuals are simply unable to relocate due to family or other personal reasons, Careerbuilder has claimed that 44% of employees are “willing to relocate for a career opportunity.” If you are one of those people, you’ll want to check out these tips on what to expect before moving for work. Despite the headache of having to switch everything over, adjust to a new location, and pay for all of those moving expenses, some employers are willing to cover them. There aren’t too many that are willing to pay for full-service relocation packages, but depending on the demand for employees, you might be able to get away with paying nothing at all (or a small portion). But regardless if they’re paying for your move or not, here’s what you’ll want to keep in mind before going. If you have a family, the first question you will need to ask them is if they are willing to relocate as well. It would also be a good idea to take some time to visit the new location and visit some new houses before buying one right away. Even if you can’t find the perfect home during the visits, it’s still beneficial to get to know the area. You might find a good restaurant, park, or other attraction so you will have something to look forward to before moving. These places can also help you to feel more comfortable about your decision to relocate for work. It’s not likely that anyone is able to find a permanent home before moving day. But finding a place to stay that offers month-to-month leasing can buy some time until you do find the perfect place to call your own again. If you have kids that are in school, make sure to check out the school districts before committing to your new home. Some companies are also willing to cover the cost of first and/or second month’s rent. It’s common for corporations to place employees in executive condos, apartments, or home that’s particularly used on a temporary basis. If your company is covering your moving expenses, it’s important to know what exactly is covered. Some packages only cover the transportation costs while others go as far as managing your entire move, packing, furniture assembly, and moving your belongings for you. In some cases, employers will offer a lump sum to their employees. So you will want to make sure that you keep all receipts from your move, such as packing supplies, movers, and gas for the moving truck. Also keep in mind that you may qualify for a tax deduction if you moved more than 50 miles. In some case, temporary housing won’t have the space to fit all of your belongings. There also isn’t much point in unpacking everything if you’ll only be living there for a few months. So it’s important to find a secure storage space that allows easy access to your belongings, as well as accommodations for moving everything to your new location. The storage spaces at Chicago Office Movers is designed to hold large, heavy items, including desks, office furniture, warehouse equipment, and other large assets. We also offer insurance plans to keep your belongings covered at all times. Anyone who has moved before knows perfectly well that surprise expenses pop up throughout the moving process. But some companies understand this and are willing to cover them too. Some are even willing to compensate up to $5,000! Just make sure to save your receipts to support your reasoning. In addition to covering moving costs, some employees have been able to use this money for their down-payments on new homes or first rent payments. Some cases might involve a family member staying behind temporarily, so an extra rent payment that can be covered with these additional funds. Nobody really looks forward to the moving process when relocating for work, but for some professions, it’s necessary. But it’s important to know what exactly is covered within company relocation packages, if offered, and any other perks to make things easier. Also keep in mind that some things are negotiable. As long as you stay within reason, you may end up with a lot more than what you started – all because you said something! While finding a mover to move your home is important, you’ll also need one to move the company. Specializing in commercial moving, Chicago Office Movers handle everything from move management to transporting heavy equipment both short and long distances. 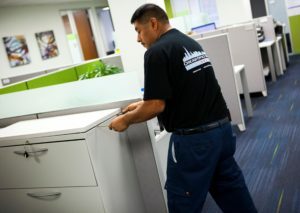 Our union movers specialize in commercial moving and can handle all of your business relocation needs. Give us a call for a free estimate! With the vast number of businesses in different industries, we understand that specialty equipment will vary. But with the help of our moving resources, we can safely pack and relocate everything you need to your new location. Our professionals are also licensed, trained, experienced, uniformed, and background-checked to keep your business protected at all times. Especially when it comes to keeping your items safe and any physical documents confidential, you can depend on us to cover the relocation process while you focus on your business needs. For a free estimate on our commercial moving services, contact Chicago Office Movers at 312-244-2246 or fill out a contact form and we will contact you shortly!